Google life experience degrees and endless fake degree sites will pop up. Some will even blatantly state your degree is ‘accredited’. The more frightening aspect of this is there are actually people who will fall victim to the scam, spending a lot of money in hopes of validation. On the next level, there are even people pulling a career with these fake degrees at their back. It is deception at its best. 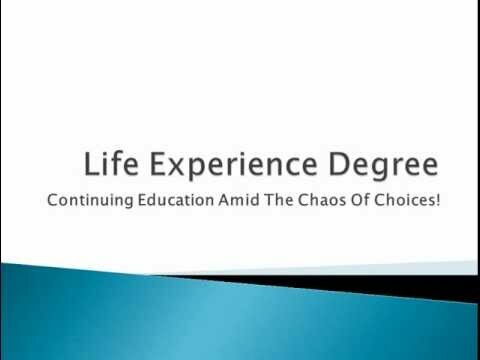 But do real accredited universities offer life experience degrees? Don’t despair, they do. The growing number of schools offering college credits in exchange for life and work experience is the real deal. These college and universities represent a new wave of older, non-traditional college candidates looking to forward their life goals. It is working. An accredited life experience based college degree is credits earned for achievements in job training, employment history, work skills and education. Accredited life experience based college degrees are available from many 2- and 4-year colleges and universities. By approaching a college and simply checking out their admission policies you can ascertain whether or not your life experience is a valuable tool for credit exchange. Anybody who has solid work experience in their area of study, certificates, licenses, or on-the-job training should explore credit exchange options. Many schools offer competency exams to test out of classes such as history, foreign languages, literature, business law and finance. This has been commonplace for awhile, however more courses are branching out into uncharted territory via competency tests and online learning. Educational institutions are struggling with declining enrollments as The 2015 Survey of Admissions Directors revealed. Admission directors are very concerned about enrollment goals, so educational perspectives are rapidly changing in a ‘differentiate or die’ environment. With that, colleges are creating pilot programs to stand out from the rest. Online learning and life experience credits are a couple of emerging efforts to open the doors for more students. The difference between authentic life experience credits and diploma mills is the promise. Diploma mills will promise the whole degree with life experience, accredited colleges max out at one year with portfolios, work training, and competency tests. Credits are assigned differently by each university. Some colleges will have stricter requirement while others will only require a page with supplemental proof. Double check with the admission department when you plan to transfer to be sure all your credits will transfer. Many colleges will accept portfolio credit awarded by another university. Without Walls program offers credit for life experience. Applicants must complete a rigorous process to receive credit. Accepts portfolio credits added from another university. Up to 30 credit hours of portfolio credit with Charter Oak State College partnership. How is a credit-for-life experience portfolio evaluated? When you are putting together your portfolio, they will assess your ability to organize and present verifiable evidence through a narrative which explains reasons for the college credit exchange. Expect for the future to include many more names to this list as life experience becomes more requested by students looking to accelerate their career path. Older Students are now looking this as a necessity to continue their career path. This is today’s standard in academic expectations.